Yeshivat Derech Haim was established for students in Bnei Brak and the surrounding cities of Gush Dan. Rabbi Rafael Alkarif, shlit"a is head of the Yeshiva and is very involved in the students' education. During the past 35 years, the Rav has taught many students of them many continue to learn Torah and work Torah related fields. His staff of teachers are experienced in education and teaching. The method of teaching in the Yeshiva is unique in the way that it combines the literal gemara explanations of the Rishonim along with the analysis utilized today in Yeshivot. 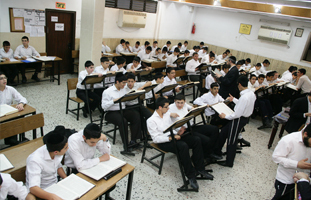 The Yeshiva record is very high for graduating students from the past 18 years almost all classes finished 3 years later with almost the same amount of students it started as. We thank Hashem for the success we've had in the past and our prayers are for us to continue in the same path.